Economists like to frame everything in terms of economics. One fairly hot topic these days is “health capital”, a stock into which we invest (by avoiding disease, eating well, exercising, and so forth) and which later pays a return (more success in school, higher wages, and what have you). Doug Almond’s fascinating paper about Ramadan is one demonstration of how big these returns can be: a small change in in utero nutrition can have massive effects on eventual physical and mental health, and impact eventual wealth as well. Health capital will also depreciate over time if you don’t maintain it: if you want to stay healthy you have to keep eating well and exercising. When I go to the developing world to collect data, the cost of maintaining my health capital goes way up. It’s often difficult to find space or time to exercise, and depreciation (from pollution, water-borne illnesses, stress, excessive UV radiation, etc.) is so high that it often feels like I’m actively spending out of the principal of my endowment. Eight months collecting data in Malawi? That’ll be 5% of your overall health, please. I’m sure I’m not unique in this problem: most people lose access to their preferred diets or exercise regimens for various reasons at some point, and being short of the time, space, or equipment needed for a workout is a common complaint. 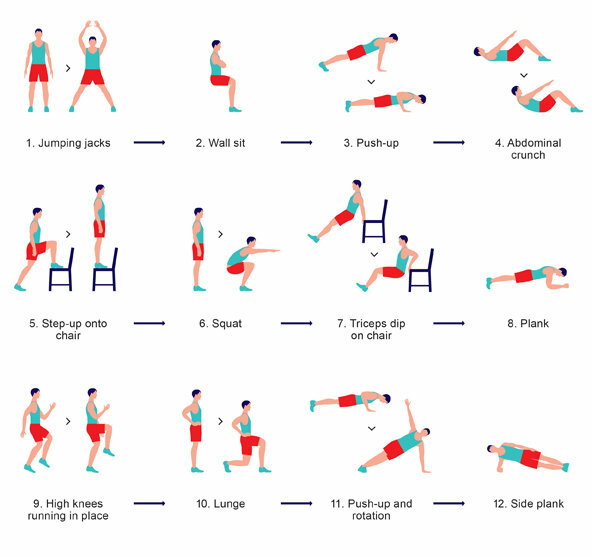 I’ve never had much in the way of a solution to this problem before, but this NYT piece points to a new workout that takes only seven minutes – and is summarized in a single nifty diagram. I plan to try this out during my next trip to Africa – tentatively scheduled for mid-June. *They overstate their case a bit, making claims that are supported by references to similar exercises. This just seems to be crying out for an experiment. Or, you can just find a yoga class. All those moves look yoga -based. Why do something by yourself for free when you can pay someone to join their yoga class? Jason, how many fliers for yoga classes did you see while in Malawi? Joel, the expats in the closest major town actually have a weekly Zumba class, which is the same as Yoga as far as I’m concerned. If I’m not running or at least shooting layups, it’s not real exercise. Previous Previous post: Should we keep providing foreign aid through governments?